C. K. Dexter Haven has lost his wife to his alcoholism and has not yet recovered from the loss two years on. Who can blame him? Tracy Lord (Katherine Hepburn), a wealthy Philadelphia socialite, appears intimidatingly unattainable even for a suave gentleman of Dexter’s standing and yet, so disarmingly lovable. When we first meet them, they are just about to separate; or rather, Tracy is just about to throw Dexter out of her mansion. When we next meet them, Tracy is about to marry another man, George Kittredge (John Howard). It is a mismatch made in hell: Tracy is vivacious and commanding, George lacks character and humor. He claims to be a self-made man but the only evidence of anything made is money. Dexter, in a last-ditch attempt to save Tracy from a marriage inked in boredom and to save himself from his misery, hires two journalists from Spy Magazine to report on the wedding — to ostensibly prevent it from happening. Mike Connor (James Stewart) and Elizabeth Imbrie (Ruth Hussey) make an auspicious arrival and, although warmly welcomed by Tracy’s mother and sister, are known by everyone to be up to no good from the start. Yet, Mike, despite taking on the assignment apprehensively, begins to warm to the environment after a chance meeting with Tracy at the library — who is, on her wedding day, there to read Mike’s published book. Gradually Mark is added to the already convoluted romantic triangle. This being one of the crowning achievements of slapstick comedies of the Classic Hollywood period, the text is all humor and wit with no fat to trim, but the fulcrum of The Philadelphia Story’s screenplay is the meticulously rendered characterization of its ensemble. They are written to gel together seamlessly in what Stanley Cavell’s dubbed a comedy of remarriage, each serving a purpose but strictly avoiding archetypal generalizations. The structure of these characterizations is twofold: what we learn about each character on the first impression and what we learn the same character as their vulnerabilities come to the fore to alter or affirm that first impression; and while that is true of a vast number of films, the extent to which The Philadelphia Story follows this order for all of its five principal characters is significant. Take for example our first impression of Dexter and Tracy. Dexter is shunned by his wife (immediately gaining our empathy) but also senselessly violent with her (immediately losing our sympathy). Tracy is frustrated with her husband (visualized by her breaking his golf club on her knee) but also an imposing figure as she kicks him out. But the film keeps shaping and reshaping these perceptions. There are no straight expository links, only suggestive shades of character. We spend the duration of the film in the Lord mansion and gradually connect with these people as they connect with each other, revealing different facets of themselves with each interaction. So much is evident in our encounter with Dexter and Tracy: their marital problems, their dynamic, their power structure. Yet, we are challenged continuously as the film progresses. Is Dexter’s incongruous violence in the beginning an inexcusable act of helpless frustration or one of drunken misdemeanor? Is it an indication of a larger message about the intolerance in men of women in power, exemplified later again in Tracy’s father’s grotesquely sexist remarks about his affair with a younger woman? Slowly, Tracy’s steely, reserved grandeur begins to show itself as her biggest shortcoming. The woman who holds power over three men at once feels disconnected from all of them at the same time. “I don’t want to be worshiped,” she says, “I want to be loved.” Dexter, on the other hand, is vulnerable to his alcoholism but also to Tracy. His frustration that materialized itself in the form of violence has now become cunning, but instead of portraying him as a man who has plotted a revenge, we simply accept him as a man whose personality we didn’t fully comprehend. With the benefit of hindsight, it is easy to deduce that the comic separation of Dexter and Tracy at the beginning foreshadows a film about their reunion, but the means to that end — a point at which they have completely reformed our perception of them — is not exactly what the audience had expected. A similar trajectory can be traced for the other couple that end the film together, Mike and Elizabeth. In our first encounter with them, Mike is agitated and angry and reluctant about the assignment. Elizabeth seems poised and realistic and shrugs off the assignment with caustic remarks about her financial needs. Stewart gets increasingly awkward as the day wears on. His vulnerability is his absolute lack of confidence, which Stewart shades with subtle colors even at Mike’s most glorious moment of confessing his love to Tracy with a kiss. By the end, he is defeated in romance but victorious in finally emerging out of his shell. On the other hand, Liz’s repressed emotions are continuously internalized. She remains in command of herself but entirely inexpressive despite our first impression. This level of nuance in characterization is impossible with a cast that lags behind the text, but this ensemble is always one step ahead. Hepburn is magisterial and tender in equal measure and possesses impeccable comic timing. She has the physique and demeanor of a goddess but can tug at our heartstrings with pleading, tearful eyes as she recounts her past. Jimmy Stewart has never shown as much physicality in his comedy, superbly utilizing his lanky, slim body even in throwaway sequences like one where he steals a decorative pen. Grant and Hussey also find a poignant balance between sharp-tongued comedy and grounded humanity in their characters. John Howard, similarly, breathes life into an otherwise stiff character. 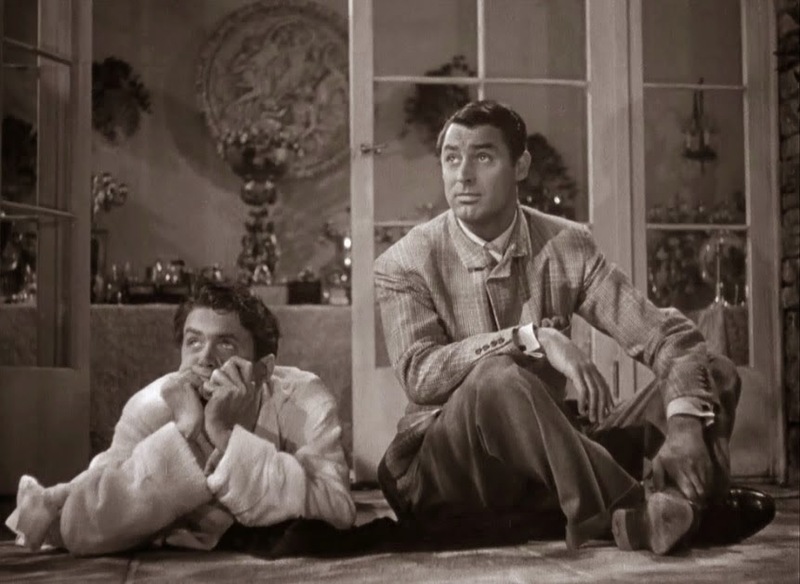 He’s tremendously aided by that carefully parted hair and expertly tailored suit, perhaps overcompensating for what he lacks in gravitas — compare him to the casual chic attire on Grant — but he finds tenderness where his companions in the film do not; and the same can be said of the film as a whole: slapstick comedies have rarely felt as emotionally resonant as this one. Oh, boy, I love this review. Banal to say, but what's great about movies I love, like this one, is how rewarding it is to watch them again and again and hearing you express why you like it make me think of so many things I hadn't thought of in a while. I LOVE James Stewart here, always found it so odd his performance is considered one of his lesser works. And a what a film that it has faith in its audience enough to give arguably its best, romantic scene to the two people who don't end up together (Tracy and Mike drunkenly dancing).